« Innovation for Consumers: E-cigarettes and novel tobacco products – Part of the problem or part of the solution? The draft legislation is almost completely disproportionate in its approach to tobacco harm reduction technologies. It mostly treats reduced-risk products as though they are the same as smoking products. The alternative philosophy, which we advocate, is to adopt ‘risk proportionate regulation’ that encourages (or rather, does not inhibit) smokers from using vaping, novel nicotine products, heated tobacco or smokeless tobacco products to quit smoking. Our full 20-page submission is here. The short summary is reproduced below. The draft Bill does not sufficiently differentiate between nicotine products of very widely differing risk to health. It does not embrace the definition of ‘tobacco control’ used in the WHO FCTC, which includes ‘harm reduction’. As these products are rising in importance, this is a significant weakness in a major Bill that should set direction for several years. We are concerned the draft Bill will cause harm to health by obstructing smokers switching from high risk combustible products (cigarettes) to low-risk non-combustible products (including vaping, heated products and smokeless tobacco). These switches should be encouraged. There is a substantial body of evidence that electronic nicotine delivery systems (ENDS) and other low-risk products are helping smokers to quit. This could help countries meet targets for reducing non-communicable diseases more rapidly and at minimal cost to government. Many countries are now revising their approach to new technologies that compete with cigarettes, most recently New Zealand and Canada. Countries like the UK have adopted ‘risk proportionate’, which is championed by the Royal College of Physicians and Public Health England. It would be disappointing if South Africa adopted a backward-looking tobacco control Bill just as other countries were modernising their approach. We are concerned that the draft Bill would protect the cigarette trade and favour the incumbent tobacco industry. The draft Bill would erect barriers to entry to innovative low-risk products and by make access to lower risk products more difficult, less appealing and more expensive. The Bill presents an opportunity for South Africa to lead in tobacco policy, to influence low and middle income countries, especially in Africa, and to lead thinking in WHO. But this will require a different approach to that used in the current draft Bill. We have made a range of suggestions for text amendment in Section 2, but the most important step is to redefine the strategic policy intent to exploit the opportunities of tobacco harm reduction rather than treat them as a threat. In Section 1 of this submission, we provide some context and a brief introduction to the concept of tobacco harm reduction. In Section 2, we set out proposals for amending the Bill. We commence this section with a suggested change in strategic intent as this would underpin proposed text changes. In Section 3, we provide five insights into tobacco harm reduction policy drawn from the 2016 report of the Royal College of Physicians. We hope the Ministry finds these insights persuasive and useful as it develops this legislation. I hope the Government of South Africa has the wisdom to rethink. Otherwise I fear they will be going backwards on tobacco harm reduction just as others are advancing. what’s the penalty in SA for doing say 30 kph above the speed limit? I think your amendments are excellent and favourable to vapers. But a bit of pipe tobacco rolled up in a twist of newspaper, smoked and thrown to the ground, or a cigarette from a pack, outdoes the hoo-ha of vaping any day to a rural person of poverty. South Africa has massive problems, the least of which is smoking! Vaping is for the privileged who have basic equipment like electricity – or food….. 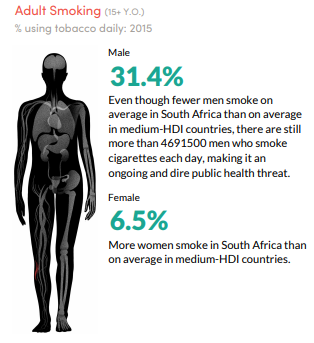 I wonder how Tobacco Control devised the Tobacco Atlas when there are no accurate figures on how many people actually LIVE in South Africa? It’s magick!